Super fast delivery, great price and very well packaged. Thank you Tayna. The battery itself didn't fit but that's more a problem of the vehicle rather than the battery. Bought one of these batteries in July 2017 to replace the identical one in my vehicle that had lasted over 5 years. Hoiwever the replacement failed after onlky 10 months. Contacted Tanya who after verifying that the battery was in fact flat supplied a replacement under guarantee. Prompt efficient service thank you. Although I haven't used this new battery yet (it's on charge for use later) This is a replacement for my identical battery that I use in my caravan as the leisure/mover battery. 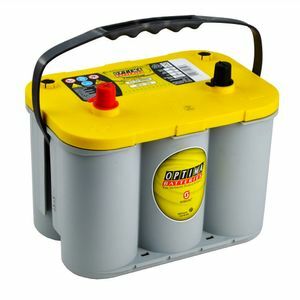 This is an outstanding battery with great stamina and which is used to provide power 'of the grid' for a night or two. I cannot fault the battery and only needed a new one due to me leaving the other one in the caravan in an unexpected cold snap which damaged it. Tanya had one in sock and sent/delivered in excellent time and the packing was perfect as delivered, I cannot fault anything with the service thus far. Excellent battery which arrived next day and very well packed. Excellent product, excellent service , 10/10 would recommend very highly to anyone looking for first class service. Many thanx . Tayna batteries are a pleasure to deal with. You get next day delivery and the batteries are extremely well packed. No damage and no hassle. I wouldn't go anywhere else! I am using the Optima Yellow Top Batteries (x 2) in my mobility scooter and I am very satisfied with them. They are an excellent product and work well in this situation. Many thanks! Bought as a secondary battery (to run camping fridge) in my L322 Range Rover - its compact, very high capacity for the size and is gel, so hopefully no leaks in the rear well of the boot.... installed about 6months ago and performing well. Excellent prompt delivery from Tayna, thank you. Excellent service from start to finish. Well done.